Update: left in the frig for a bit, but I wouldn't suggest this because it got very runny. It was best when I first mixed it up. 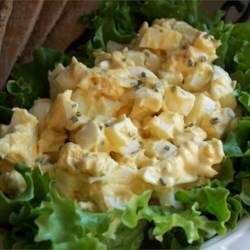 Still, a great egg salad/spread! I am going to use the filling for deviled eggs for Father's Day. Original review: I wanted a cold salad/spread for sandwiches for lunch today. I chose this one, and my husband said it tasted like his grandmother's egg salad, which is high praise indeed! Thanks for the post!